It has been said before that it is highly encouraged that we eat at least 5 small meals in a day. Therefore, snacks are just as important as breakfast, lunch and dinner. I love taking afternoon snacks! This is when I would allow myself to take in a little more junk food than I really should. Of course, I try to balance this out also by snacking on fruits or a light salad on some days. This week, my mom was my afternoon snack companion and we have discovered two delicious snack items which I think you would also enjoy! I honestly think I will never ever get tired of eating sushi! If given a chance, I think I can have sushi every single day! However, eating at a Japanese restaurant can be pretty costly and so we were happy to chance upon Cold Storage's sushi selections! For only Php. 150, you can have a small tray filled with 16 pcs. of California Maki! 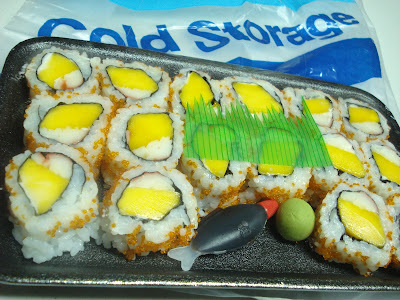 Each piece will give you a plump slice of sweet mango, chewy cold kani all rolled into one and covered with orange ebiko! This is actually a perfect choice also for those who would like to have sushi on the go! Mom and I couldn't decide which one to try first and so we cooked them both! Good thing, Pan and Papa were also game to join our afternoon snack time. 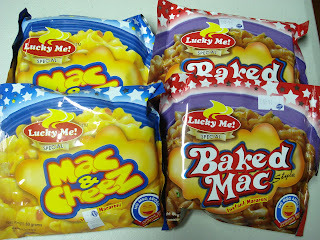 Lucky Me has recently launched a new line of instant macaroni packs for only Php. 14. Cooking this is easy! Simply boil a pot of water, add in the macaroni and cook for 4 minutes. As soon as the macaroni is ready, take a strainer and remove the water to dry the macaroni. 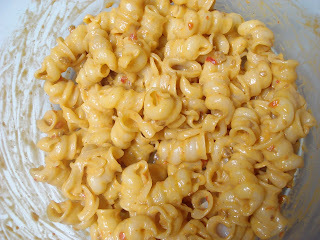 Mix in the cheese/baked mac mix right away. 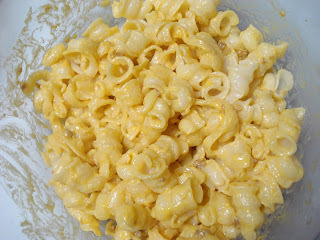 The Mac & Cheez has a light yellow color and the cheese flavor was pretty prominent. However, I find it a bit too salty for my taste. The Baked Mac, on the other hand, has a sweet tomato flavor which I feel would be a hit with the kids. My family also liked it because it has a very meaty flavor that has enhanced its over-all taste. How about you, what's your latest snack discovery? I love love love Oishi's Sponge Crunch! both the choco and cheese flavors are YUM! @ria: oh i havent tried the sponge crunch is it like oishi's pillows?